The hostel is great! We stayed there for one week in a four bed dorm. Although the room is really small, it's cosy and nice. The bathrooms are not separated between boys and girls, but that wasn't a problem for us. The showers and toilets are really clean. The kitchen was awesome! Good atmosphere, everything you needed for cooking was there. 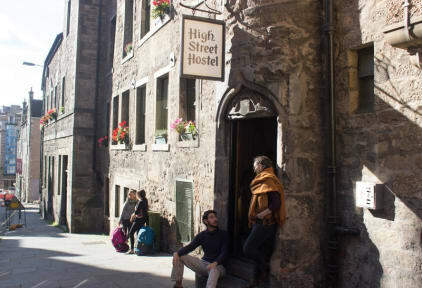 The hostel is in a great location - just around the corner at the Royal Mile. The only thing I didn't like was that there were no cupboards in the rooms. great hostel, great social areas, relaxed people, free lockers and linnen, friendly staff, big fully equipped kitchen etc. highly recommended! Very vor very nice people. The hostel is quiet pretty and the kitchen has everything you need, including tea and hot chocolate for free! Top Hostel! Die Lage ist super zentral und die Stimmung ist echt gut. Alles da, was man braucht und nettes Personal. We loved the kitchen and common areas. Super nice atmosphere! Kitchen has gas stoves - great to actually cook. Also it's very spacy, so you don't bump into people too often. Breakfast is fairly cheap and worth it. Bedrooms and sanitary rooms are average clean. Joined the pub crawl, had a good time! Everything was fine :-) I enjoyed my stay!! Die Lage ist sensationell, zentraler geht's nicht. Alles ist schnell zu Fuß erreichbar. Das Personal ist sehr hilfsbereit.